Stand with churches across America for kids in foster care. Orphan Sunday is a day for the Church to come together, “One Day. One Voice. One Purpose” in thought and deed, to focus on those children in crisis around the world. Watch Bishop Aaron Blake and the start of Stand Sunday. There are 8,918 children in the foster care system in Tennessee. CAFO (the Christian Alliance for Orphans) has just issued a challenge to the churches of Tennessee! There are 95 counties in Tennessee and they’d like to see ONE church in EACH county praying for the orphan or for children in foster care on November 11th! Let’s engage in this spark to add to the fire that’s created for the fatherless on this day! Engage your church and ask your friends and families in other counties! We will help you! Message us here! Get your church involved today! 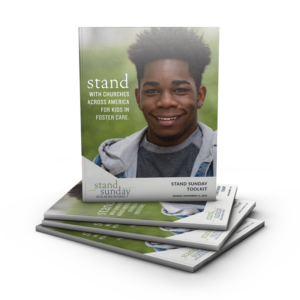 There are foster care-specific posters, post cards, PDF’s, videos, partnership packages, and more available to help you and your church stand for children in foster care. To see all that is available, simply click here. Check-in your event or activity and let others find you on Stand Sunday. No matter how big or small, add to the echo of Stand Sunday around the world. View the Stand Sunday Map here. Message Tennessee Alliance for Kids (TAK) to find out how many children are in foster care in your county, to get your church to pray, to get your class or family to collect needed items, and more. Get in touch with us here.